Sustainable Agriculture in the Spotlight: Fresh films, books, etc. 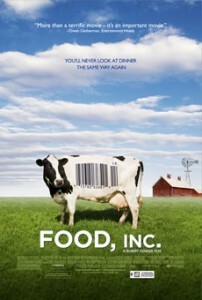 Update (8/13/09): A dozen other important food-focused films have just been highlighted by Serious Eats. For additional information on sustainable agriculture and good, real food, check out resources such as: Organic Consumers Association, The Land Institute, Roots of Change, Slow Food USA or Slow Food International, Fields of Plenty, Animal Welfare Approved, and Certified Humane. Please support small, organic farms and your local farmers markets; consider joining a Community Supported Agriculture (CSA) farm or growing some organic produce in your yard or a community garden; and if you eat meat or dairy products, choose products (e.g., Niman Ranch) that come from humanely raised, non-hormone-boosted animals. To sign the Declaration for Healthy Food and Agriculture (from Roots for Change), click here. On a related note: Today (August 5) is Wendell Berry’s 75th birthday! Wendell Berry is a prolific writer and poet, a life-long Kentucky farmer, and an advocate of sustainable agriculture.